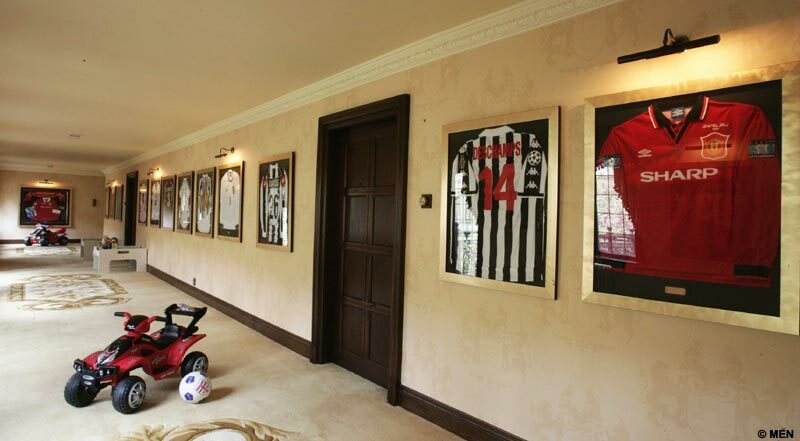 Footballer Phil Neville and wife Julie have placed their Versace-themed home on the market. But the £4million mansion is only available to people with names beginning with P and J, unless you want to transform it. For the initials are woven into many of the garish carpets and are even on the front gates. 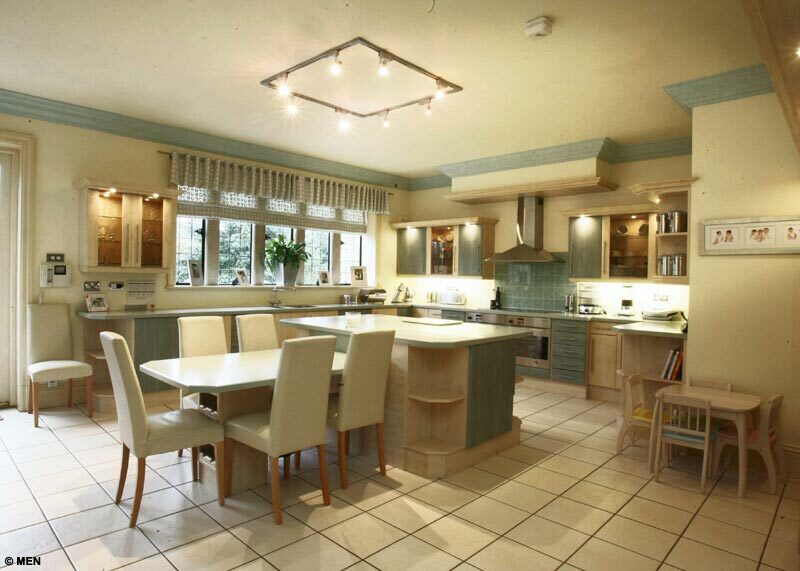 The couple look set to make a profit of more than £3million on the flamboyant property in Crawshawbooth, Lancashire. Everton star Neville, 31, and his wife paid £600,000 for Sunnyside House, which was a 27-bedroom conference centre, nine years ago. 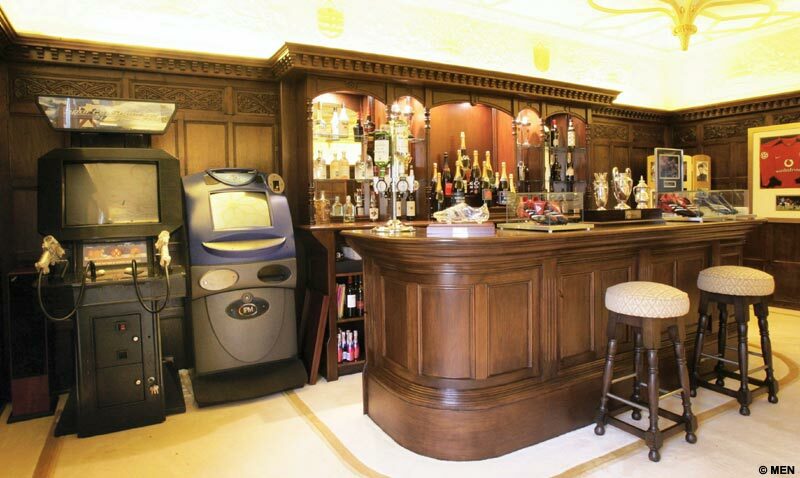 Now it has six bedrooms, four of which are suites, and even its own bar in the sitting room - housing Neville's man of the match bottles of champagne alongside the spirit optics. 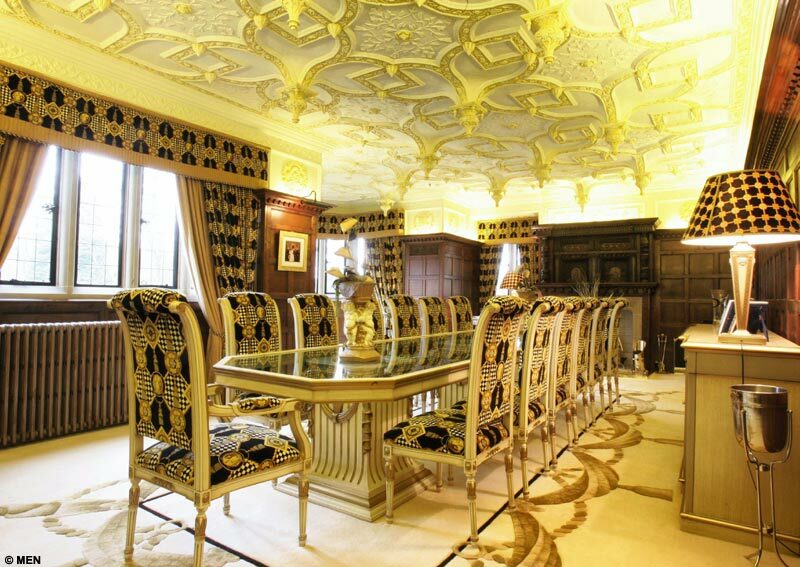 The dining room is decked out almost entirely in WAGs' favourite Versace - complete with golden ceiling. 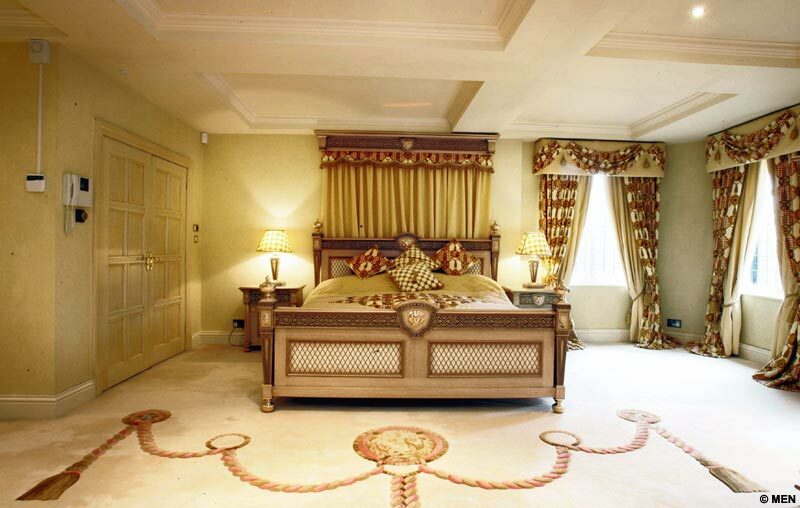 The master bedroom is also an homage to the Italian designer. There is also a fitness room, cinema room and a four-bedroomed separate staff house in the nine-acre grounds, which include a tennis court. The couple were given clearance from the English Heritage to replace the windows in the Grade II listed building. But their hopes to build a separate swimming pool were dashed by local planners after the Rossendale Civic Trust objected. "Getting the windows done was a nightmare," said Neville. "We tried to get them repaired, but they were so fragile no one would touch them, so in the end we found a firm in London able to create some exact replicas and they were approved by English Heritage and they do look wonderful. "It will always be a very special to us, our first home together." What was once a snooker room is now a kids' toy zone and what was once the garage has been given over to be a huge climbing/soft play area for son Harvey, seven and four-year-old Isabella - who even have their own mini quad bikes to use inside. 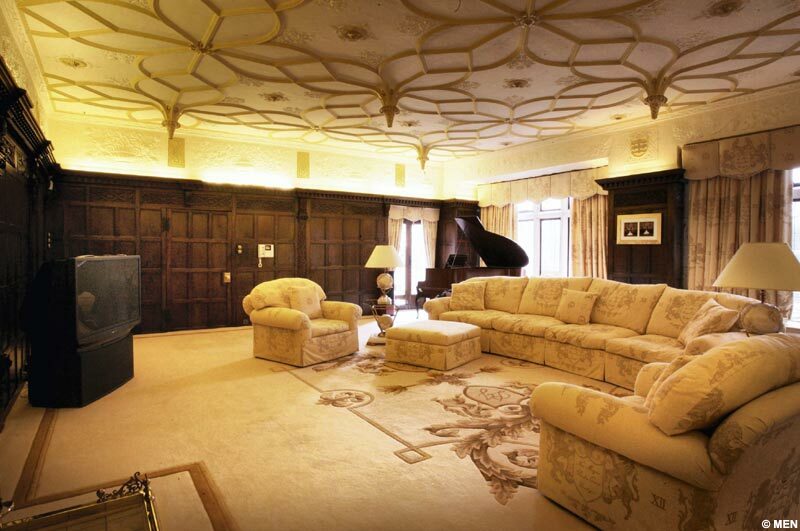 "It felt more like a church inside, all hard floors and lots of panelling and absolutely freezing but it still had all the original features and we just loved it," added Neville, who hopes to sell the property as soon as possible through Harrogate estate agents Knight Frank. Neville, who was playing for Manchester United when he bought Sunnyside House, is now living in Beetham Tower, the tallest residential building in Europe, in Manchester city centre. He paid more than £1million for three apartments on the 44th, 45th and 46th floors of the complex and transformed them into a triplex because of the difficulty he had in travelling from Crawshawbooth to training in Liverpool. "We found we were spending so long in the cars with me commuting to work at Everton and Julie taking the children to school that we had little home life," he continued. "We converted three apartments into one space at Beetham and it works really really well."